NSW Final Rank = ? QLD Police Rank: Constable = appointed ? ? ? Sergeant – appointed ? ? ? Senior Sergeant – appointed ? ? ? Inspector – appointed ? ? ? Born on the 21st of August 1966 at Liverpool, New South Wales (go the Blues), my first couple of years were living at nearby Glenfield where my grandparents ran a bakery. Dad (also Les) was a Baker by trade but had joined the NSW Police in 1966, meeting the then arduous entry exam of standing upright, being over 6 foot tall, knowing his left from right and being a reasonably handy footballer. My brother Greg was born in February 1968. About two months later my birth mother left us with Dad and we never saw her again. Nowadays you’d say probably post-natal depression or something, back then, none of that was spoken about. My brother and I tried to find her about 20 years ago via the Salvos, mainly out of curiosity and got the message back from them that she didn’t want contact. After she left, Greg and I went to live with our grandparents, as Dad was working shift work. Shortly after that, they retired and we moved to St Georges Basin near Nowra. The NSW Police being the modern organisation it was in the 1960’s, took pity on Dad, as he had asked for a compassionate transfer to Nowra to be near us, instead sent him to Narrandera, about 500 km west, so we saw him on his days off. Anyway, as luck would have it, a very kind Inspector called Jim Imber worked some magic and after 6 months Dad ended up at Nowra. Jim and Dad became lifelong friends until Jim passed about 10 years ago. Life, as I vaguely remember it back then, was everything a young lad would want, we went fishing a lot, camping, swimming and sports. I started my schooling at St Georges Basin Public School in 1971. In 1972, Dad brought home a young nurse, Irene Dawson, that he’d met at a post mortem, ever the romantic. My brother plonked onto her lap and asked her if she was our new Mummy, that sealed the deal! In 1974 Dad married Mum (she is our Mum in every sense). Later that year we moved to Rankin Springs in western NSW where Dad was the only police officer. We stayed three years and two baby sisters later, moved to the place I call my home town, Guyra. Dad was the Lock Up Keeper and then promoted to the Sergeant, Officer in Charge. I truly loved my time in Guyra, great town, good people, nothing like those strange Glen Innes or Uralla folks we used to play football against. I left school in 1983 and started work at the Commonwealth Bank. To say banking wasn’t for me is an understatement. However, as I didn’t have my Higher School Certificate I couldn’t join the police, which is what I really wanted to do. I went to TAFE in Armidale three nights a week for two years and got my HSC. In the interim I also had a mobile disco business I did on weekends between playing basketball, cricket, union and league (odd game of soccer as well). I really enjoyed the mobile disco and as Mum used to say, I had a great face for radio. One thing Mum used to make all us kids do was our ironing, share the cooking, housekeeping etc. Really, who did she think she was, just because she worked as a nurse on a 24/7 roster, however when I left home eventually, I was housebroken. I’m quite particular and as Cindy will attest, I still do my own ironing as I’m a bit quirky in where the creases go etc. In 1986 I applied to join the NSW Police but at the same time was transferred to Broken Hill with the bank as an Assistant Loans Officer. I decided to go as I got to live in the bank barracks, paid $2 a week rent, a cleaner was supplied and $50 a fortnight each the 12 residents which covered food and a keg always on tap. I thought I’ll save a fortune, never saved a cent. A group of us would trip off to Melbourne, Adelaide and all points in between. I did have a great time though! However, in 1987 I was accepted to the NSW Police, what I’ve always wanted to do and started in June 1987, graduating in September 1987. I actually won the public speaking award (hard to believe) for the class of 200, one of my proudest moments was marching out to collect it from the Commissioner, with a salute, in front of my parents, Nan (Pop has passed by then) and family. My Dad, who retired as an Inspector at Lismore in 2003, gave me three bits of good policing advice when I joined. They were never rush to a fight at a Hotel, never beat the Ambulance to a traffic accident and get a signature no one can read! When at the NSW Police Academy, all Recruits were asked to list three preferences for placement, I put Armidale, Tamworth and Broken Hill. Obviously my choices were considered long and hard by the HR gurus as I was sent straight to Kings Cross! I really had a ball working there, never a dull moment for a bright eyed young Constable from Guyra who had been to Sydney about four times, all to watch my beloved Parramatta Eels play. During that time I’d also met the first Mrs Bulluss and in 1990 transferred to Dareton some 1200km south west of Sydney. Followed that with a posting to Gulargambone, back to Kings Cross and finally Warialda. Not much to say except the marriage produced four beautiful children of whom I’m extremely proud. They all moved to the Gold Coast when the marriage ended and I decided if I wanted to see my children, I’d better move to Queensland. I joined the Queensland Police in 2000 and was stationed at Broadbeach. I then went to the Police Beat at Robina Town Centre where I worked with Peter Venz who was the Broadbeach GSE member for 2003. He introduced me to Col Makin, two months later I was jetting off to India and Nepal on my life changing GSE experience in 2004. About the same time Cindy and I became an item and in 2005 we were married. I was promoted to Sergeant at Broadbeach in 2005. In 2006, I’m sure you’d all remember the episode, I was a contestant on Temptation (the new Sale of the Century). One episode only, I knew most of the answers but the carry over champ and eventual winner of the lot knew them quicker than me! That wasn’t my first foray into games shows, in 1997 I was the carry over champ on the Channel 7 show Concentration, where I ended up winning a reverse cycle air conditioner and a year’s supply of dog food. The dog thought the food was crap, it certainly was able to turn it into great piles of crap at a great rate of knots, I ended up binning the food and sold the air conditioner via the Trading Post. In 2008 I was promoted to Senior Sergeant Officer in Charge of Thursday Island in the Torres Strait, one of the greatest gigs in Australian Policing. From Saibai Island 5 km from PNG to the eastern Murray Island, the traditional home of Eddie Koki Mabo and all points in between, it was the most enjoyable operational policing I’ve ever done. To help police the division, the only one in Australia that has an international border, we had a plane, several boats, an MOU with Customs regarding free use of their helicopters and the best Esprit des Corps among all services that I’ve ever seen. The Torres Strait Islanders are an extremely generous, traditional and happy people. Catching a fish was not a hard skill to master either, generally a line in the water saw a fish on the end, sometimes a monster. In May 2008 I was inducted into the Thursday Island/Torres Strait Rotary Club, at our peak we had 12 members but really did some great work in supporting the villagers of the PNG Western Province with clothing and school supplies. I first met Bruce Kuhn in 2008 when he was allegedly my boss, and since then we have enjoyed many a soiree in Cairns or on TI, usually to our detriment the next morning. In April 2011 I transferred to Gladstone as the Officer in Charge, the shortest time ever for anyone in that role, because two months after starting I went to relieve as the District Inspector and ended up promoted to that job. I had joined the Gladstone Port Curtis Rotary Club (which was men only, not now though). 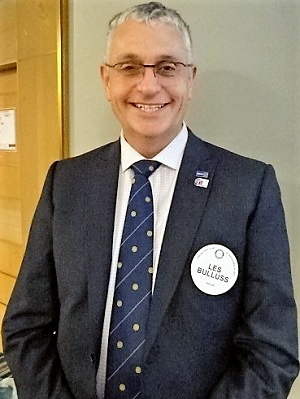 I joined that club (there are several in Gladstone) because Monday nights was the best for me to get to meetings, it is a great club and as with all of Rotary, members belong for the right reasons. The 2013 Queensland Police Service Restructure saw all Commissioned Officers jobs declared vacant, as 120 out of 420 positions had to go. Fortunately, the redundancy offer take up and existing vacancies across the service saw no one being forced out, because for a four-day very stressful period just prior to Christmas in 2012, there was talk that some people would be told don’t come Monday, but it didn’t come to that. 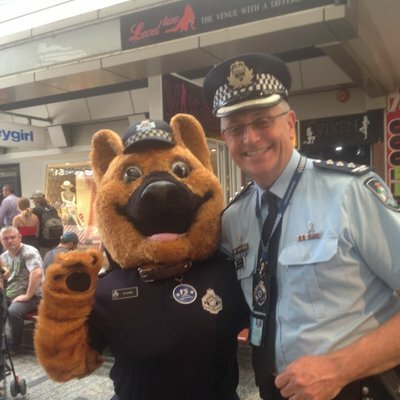 When the musical chairs music stopped, I woke up in my current job from 1 July 2013 as the Queensland Police Service Manager of Community Programs and Engagement. I’m based at Headquarters in Roma Street but really have the best Inspectors job in the QPS. I get to travel a fair bit nationally and internationally, I look after our Crime Prevention Programs, Cultural Support and other areas including the Museum. I am on the board of Neighbourhood Watch Australasia as the Queensland representative. I’m quite happy to stay in this job until I retire. Regarding Greg’s and my birth mother, in mid 2015 I took a phone call from a guy called Ian Lacy in Victoria. He told me that my birth mother had died and he was married to my half-sister, who until her mother had died didn’t know about Greg and I. It turns out that we have two half-sisters who live in Victoria. Greg and I have both met them, they are really nice and have filled in a lot of gaps for us. It’s good to know where my sons type 1 diabetes, my children’s coeliac and other health issues probably come from, because up until then, we really didn’t know. Pretty sure it was from my maternal grandmother’s side of the family. Anyway, between Cindy and I we have 6 adult children (3 boys, and 3 girls) and two wonderful grandchildren. As their parents work shifts, we have the grandkids most weekends under sufferance (not really). Three of the children live on the Gold Coast, my son is in Mackay, my eldest daughter is in Melbourne studying social work at RMIT and my second eldest daughter lives in the UK with her Englishman (treason I say). Life is very good for Cindy and I. We live at Boonooroo Park (Carrara), I’m a very happy member of Broadbeach Rotary, the greatest Rotary Club in the world! Not bad for a lad born in Liverpool. Its good to see a local boy make good.